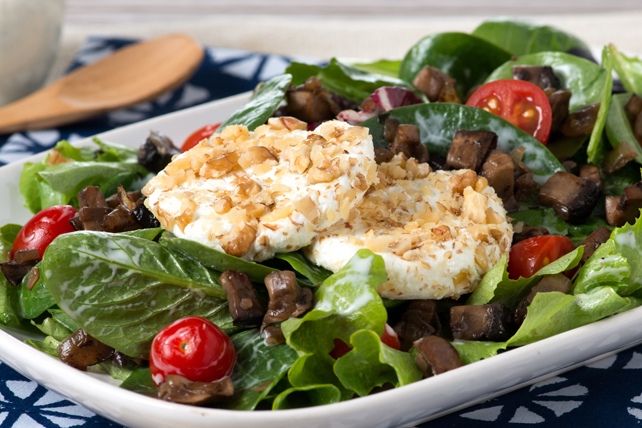 This delicious bistro-style salad is sure to impress friends and family alike. Divide cheese into 4 portions; roll each into ball, then press to 1/2-inch thickness. Sprinkle with nuts; press gently into cheese to secure. Place in single layer on parchment-covered plate. Refrigerate 1 hour or until firm. Heat broiler. Place tomatoes in single layer on rimmed baking sheet. Broil, 6 inches from heat, for 3 to 4 min. or until lightly charred. Heat oil in large skillet on medium-high heat. Add mushrooms and onions; cook 6 to 8 min. or until softened, stirring frequently and adding 1/4 cup dressing for the last 2 min. Remove from heat. Cover large platter with salad greens; drizzle with remaining dressing. Top with mushroom mixture, tomatoes and cheese. Prepare using almonds, hazelnuts or pecans. Or for a change of pace, substitute chopped fresh chives or parsley for the nuts.